In '87 happened the first public demonstration in Argentina against nuclear power -- remember, we had a long period of military government -- in '87 was the first public demonstration against nuclear power and against uranium mining with more than 500 people in my city. For you maybe few people, for us it was really a lot of people. Despite the movements of our vice-president in government, the pressure over this private company increased. And more and more control was applied to the uranium mining. Our pressure from FUNAM and from friends in NGOs increased, and due to a more and more complicated system of control, the price of the uranium and the price of the system of production increased. Thus and finally, in '89, for economic and environmental reasons, the uranium mining of Los Gigantes was closed. And this is one example of the very, very few examples of success in our country against nuclear power.
. . . the work of my organization -- my joint organization -- we have more than 1,100 NGOs in my country, and I think they are 100 percent anti-nuclear -- we propose for The Uranium Hearing in Salzburg some, I think, interesting proposals to be discussed. The first of the proposals is to constitute the world coalition against uranium trade and mining, taking into account these experiences. Second, to produce through our organization -- to constitute to the anti-International Atomic Agency -- in fact, I never understood why Austria that is non-nuclear received our best and big enemy. And third place, to produce through our organization our own standards on nuclear non-safety and also to fight and to reject all the criteria of ICRP, UNCR and BEIR. And finally, to create the global coalition of victims of radiation, people that is getting affected by x-rays, by gamma-rays, by alpha-beta particles, toxic materials that are also radioactive and so on. "We want you to stop using nuclear power and nuclear testing in our oceans and seas. We demand the removal of all nuclear power stations. The earth is a single country and all the people are its citizens. We have to share this planet, so don't be selfish. We want food to be shared so that everyone has enough. We want clean water and a home for all people. We are worried about pollution, war and children starving, while others don't appreciate the food they get. We are afraid that the world will soon belong only to the rich. This earth is more valuable than all the money in the world. We want all countries to work together to protect it." Raúl Montenegro, Argentina. Biologist, founder and President of Fundacion por la Defensa del Ambiente (FUNAM), winner of the "Global-500" Prize. First, I apologize for my English, it's really bad, but I think that it's best to speak English language. Concerning the presentation, in fact I am a mutation, because I combine activism, research and teaching. I am now President of FUNAM, that is Environment Defence Foundation. I'm an NGO from Argentina, and I am also Professor of Evolutionary Biology at the University of Cordoba, one of the oldest universities in Latin America. In fact, I worked in both fields, I have been vice-president of Greenpeace in the first Third World office in Argentina, and also President of the Argentine Association of Ecology, that is a scientific body. That is, all our work -- not only my work but of our foundation -- links activism, research and education. I will describe all the processes that have developed in my country. It started in '82 and they finished it after a long, long fighting with finally the end of the uranium mining of Los Gigantes. But I think that it is very important for you to know which is the nuclear plan of Argentina, because it's one of the most dangerous in the Third World. In fact, our nuclear power plan, our nuclear program was developed in Argentina through military governments and not by civilian governments, as everywhere from the United States to China or to Germany; every time nuclear power is linked with military people and not with civilian people. In our country we have first activities of uranium mining, we have a lot of uranium mines in activity. Now the most important is Sierra Pintada in Mendoza with a production of seven tons a year, and we have a lot of uranium mining stand by. We have also one uranium-dioxide production facility located in my province, Cordoba, that produces uranium-dioxide for nuclear fuel. We have also two different facilities to produce fuel for heavy-water and light-water reactors. At the same time, we have in my country one facility to produce heavy water. In fact, it was an investment of (...?) from Switzerland, and we have also a plant in Pilcaniyeu to produce enriched uranium. At the level of nuclear power plants, we have two nuclear power plants functioning: Embalse, in my province at 90 kilometers of my city, of around 700 megawatts electricity; and Atucha I in Buenos Aires, around 340 megawatts electricity; and under construction -- to be finished, I think, next year -- Atucha II, with 700 megawatts electricity. At the same time Argentina built a reprocessing plant. This reprocessing plant, LPR(? ), is a plant that will produce five tons of plutonium-239 per year. This plant is in 80 percent finished, but was stopped by our activities. We will describe this afterwards. And finally, we have developed the project of a repository for 3,000 containers of 3.5 tons each for a waste of high activity. And we have first in development and jointly with Brazil -- you will listen to the program from Brazil with my friends from Gamba later -- they are developing the project of a nuclear submarine, and we have the possibility of the atomic bomb. The atomic bomb is all ready, we need only the decision. This is the same for Brazil. This is in summary the nuclear plan in Argentina. It is a very dangerous plan, and I think it is very important for you to know this plan, because it was partially born in Europe, in Germany, and partially in Canada and everywhere. For this reason, our organization, FUNAM, fought during years, since 1982, against -- first against uranium mining, all the red dots are the targets of our organization working with lobbies, with coalitions of other organizations. We fight that, the uranium mining, and finally we closed, I think, the uranium mining of Los Gigantes. We're fighting against uranium-dioxide production facilities, but we failed, that is, they continue to work; against nuclear power plants, against the reprocessing plant, and now is stopped the building; against the repository that now is delayed, and against the bomb possibility. But now, I think it is important to summarize our process in uranium mining of Los Gigantes. In fact, this surface mining was opened in 1982, also during military governments, and the responsible was an enterprise named Eduardo Sanchez Iranel, working jointly with the Atomic Energy Agency. The first environmental problems appeared in 1983, particularly pollution of waters due to acidic compounds released by the uranium mining. And our fightings against this uranium mining started between '82 or '83 and '84, and our battle was increased particularly in '84. We presented by television testimonies of people of this area that moved the public opinion against this uranium mining. Also, we started to work in this period jointly with the trade unions, particularly with the trade unions that include the people that work in uranium mining. At this moment -- and this is an interesting story -- at this moment the vice-president of my country, Victor Martinez -- he was vice-president evident during the period of Alfonsin -, this vice-president was lawyer of the enterprise that was administering the uranium mining. Thus, from the vice-president -- he pushed a lot of mechanism to stop the action against uranium mining. And it is very funny, because in the year -- I don't remember the year -- when I received the Global 500 Award from the United Nations, the vice-president was present with me. And he knows me and our organization. And I used this opportunity to speak against uranium mining of Los Gigantes and to speak about the participation of leaders of the government in the process; and his face was really very serious. 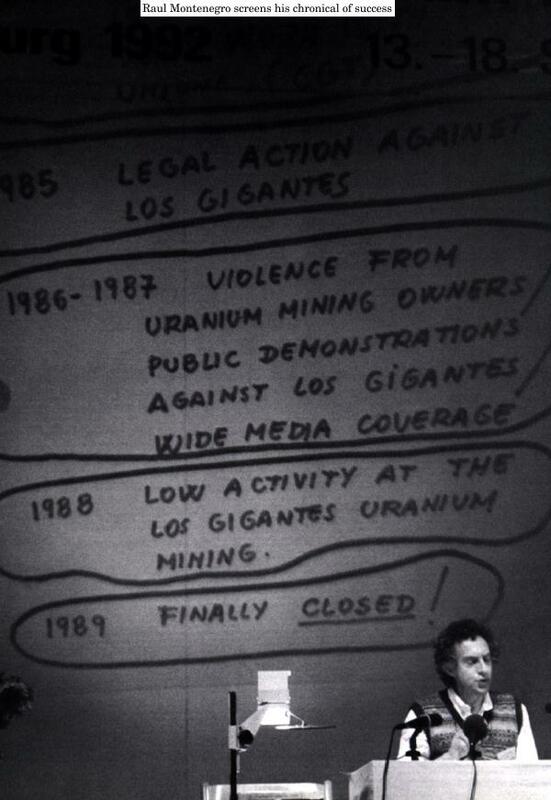 In 1985, we started legal actions against uranium mining, and some bad things happened in '86: In '86 a bomb destroyed a monitoring system in the river San Antonio. It is located in the basin where this uranium mining released its waste. This bomb destroyed totally the system of monitoring, and in the same night my car -- my car has four wheels as all the cars -- and all the four wheels have been destroyed, each of them with a stick of iron, and at that same time it started, the threatening by phone with my family and with also members of our organization. In '87 happened the first public demonstration in Argentina against nuclear power -- remember, we had a long period of military government -- in '87 was the first public demonstration against nuclear power and against uranium mining with more than 500 people in my city. For you maybe few people, for us it was really a lot of people. Despite the movements of our vice-president in government, the pressure over this private company increased. And more and more control was applied to the uranium mining. Our pressure from FUNAM and from friends in NGOs increased, and due to a more and more complicated system of control, the price of the uranium and the price of the system of production increased. Thus and finally, in '89, for economic and environmental reasons, the uranium mining of Los Gigantes was closed. And this is one example of the very, very few examples of success in our country against nuclear power. But we have a very nice news: The former proprietor of uranium mining, his name is Eduardo Sanchez Iranel, is now in jail due to corruption. And this is very nice because, you know, we received that in journals, he's fighting using the journals -- and now, in fact, we received the good news that he is in jail, and I expect that for more than the period of the plutonium -- 25,000 years. Which are now our next steps, working every time with a lot of organizations? First, we are supporting the battle of the citizens and our NGO friends in Mendoza, because Los Gigantes is closed, but now you have Sierra Pintada, it's the most important. And I think that the atmosphere is really positive in this field. Second, we are pushing atomic energy authorities to be indefinitely responsible for the health of the workers, because when the mining is closed, no more people -- I don't know the word in English -- all the workers that worked in the uranium mining are not -- employed, no, but that is not the problem, the problem is that they don't receive care after they have left the mine. And we are pushing for this. And third, and this is very important, we are increasing our battle against our two nuclear power plants and, concerning this, one of our recent battles is that in my country children, teenagers, adults visit nuclear power plants, with tours as in Salzburg, but visiting nuclear power plants. Thus, we started a strong campaign to stop this, and we sent a letter document to the Ministry of Education at some authorities, stating that they are responsible for all their life for any accident that will happen inside the nuclear power plants, independent if they are or not in the public function as functionalists in the government. Thus, I will ask to you after signatures for a document that we are producing to ask the ban of visits to nuclear power plants not only in Argentina, but also in the Third World and also in the First World, because it is not new that a lot of nuclear power plants, as you said, are places for tours, beautiful tours. Finally, evidently, this is only a part -- this is not the job of FUNAM, of our organization, it is the job of a lot of NGOs that have worked in my country. Yes, this is a technique. -- And finally, in one minute and 25 seconds, the work of my organization -- my joint organization -- we have more than 1,100 NGOs in my country, and I think they are 100 percent anti-nuclear -- we propose for The Uranium Hearing in Salzburg some, I think, interesting proposals to be discussed.